BASF SE site in Ludwigshafen. BASF feels closely connected to Rhine­­land-Palatinate and especially the Lud­­wigshafen site. This is where it all began, the company headquarters is here and some 34,000 “Aniliners” – as BASF staff are known – work here, some the third or fourth generation of their family to do so. It is only natural that we assume great responsibility towards our staff to maintain jobs in the region. This is only possible through constant further devel­­opment of the Ludwigshafen site to prepare for the future – which is what we are doing. In the 2010 site agreement for Lud­­wigs­­hafen signed together with the workers’ representatives, we undertook to invest between nine and ten billion euros in the future of the site by 2015. We are currently building a new production plant for the innovative plastic Toluoldi­iso­­cyanate (TDI) with a capacity of 300,000 tonnes per year at the site. 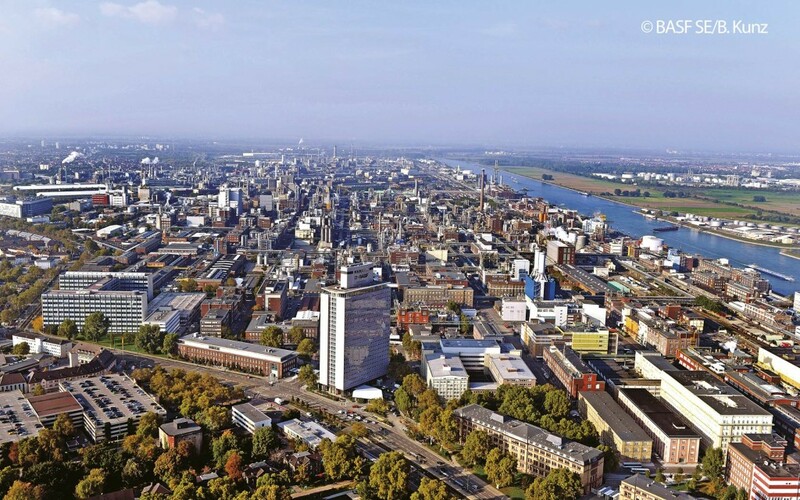 The total in­­vestment including the required infrastructure at the Ludwigshafen production facilities will amount to about one billion euros, creating some 200 new jobs at BASF alone. In addition, the world’s biggest production facility for the aroma chemical L-menthol is currently being built, while the expansion of the plant for production of the insulation material Styrodur C was finished in late 2011 in Ludwigshafen. We are continuing to develop the Ludwigshafen facilities with invest­­ments like these in order to maintain our international competitiveness. A main focus of the site agreement is the commitment to securing jobs in the long-­­term through vocational training, staff development and further training, as well as the Generations@Work programme to address demographic change. The programme was developed in 2006 to prepare our staff for a changing environment. The aim is to continue extending BASF’s competitive ability even in times of de­­mographic change and to remain innovative. Measures under the programme include age-appropriate work­spaces, a systematic transfer of knowledge, greater compatibility of work and family life, sports and health program­mes and demogra­­phically-sound pension benefits. To us, social responsibility means keeping the focus on the needs of our staff. Because of this, a new centre for work-life management will be set up by 2013 in close proximity to the Ludwigshafen site. This will make BASF’s varied range of ac­­tivities in work and family life, sport and health promotion and advice on social support and care available at a single location. The childcare capacity at BASF’s LuKids nursery for children aged from six months to three years will be tripled to 250 spaces. In addition to LuKids, a modern health programme will be offered with a comprehensive training infrastruc­­ture as well as a range of consultations and workshops. The aim is to give staff an attractive programme for maintaining their health which is close to the workplace. A “work-life balance” team will also be housed in the new centre for work-life management, along with the social support advice provided by BASF Sozialstiftung. The range of services has already been extended to include consultation on care, as part of a cooper­­ation with Arbeiterwohlfahrt Pflegeser­vi­­ces. This is based on the finding that, in future, more BASF staff will need to care for relatives as a result of demographic changes in Germany. The company is ad­­dressing this challenge early on with its com­­­prehensive range of consultation services. However, we are not only involved inside the site, but also take on our social responsibility in the entire Rhine-Neckar metropolitan region. With our social com­­mitment, we want to create an even better place for all those who live and work here. This applies to our neighbours as much as to our current and future staff and their families, and is a crucial aspect for us in remaining an attractive employer. BASF contributes to education, culture and the arts, sport, science and innovation, quality of life and the community in the Rhine-Neckar metropolitan region. Education is a focus of our promotion. At the Ludwigshafen site, students from the Rhine-Neckar metropolitan region have the opportunity to experience this first-hand by becoming researchers in the five BASF student labs. Over 18,000 pupils do their own experiments under the supervision of specialists each year. By offering this opportunity, we want to raise interest among children and young people in the natural sciences at the Lud­­wigs­hafen site. 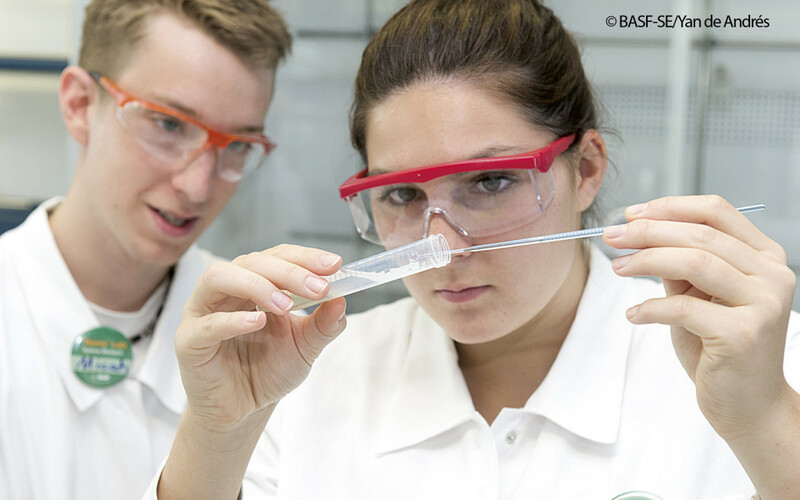 The idea of the student labs has become an export hit: BASF Kids’ Labs have been set up in 33 coun­­tries already. BASF’s five student labs are open for children and youth to experiment in. BASF is active in the field of early childhood education with another educational project – the Education Initiative Plus campaign. The company’s commitment here is to improve children’s’ chances in education and in life long-term, regardless of their background, thus boosting the attractiveness and competitiveness of the entire region. BASF has a long tradition of cultural com­­mitment: 90years of cultural programme. A core component of the pro­­gramme are the concerts at the BASF Feier­­abend­haus in Ludwigshafen. This dedication has extended to new areas of focus over the decades. While music still continues to play a main role in the pro­­gramme, fine art, dance, film and photo­­graphy have also gained importance. BASF also promotes young talent and funds pro­­jects for education in the arts. Everything we do is guided by the principle of our new corporate strategy, “We create chemistry”. This also means achieving more together than on our own. That makes col­­­laboration with representati­­ves from business, politics and science in the Rhine-Neckar metropolitan re­­­gion and Zukunftsinitiative Rheinland-Pfalz all the more important to us. Together, we want to propel our region and country into the future and promote it as an international business location. “We cre­­­ate chemistry” also means keeping close ties to our lo­­cation. We want to make a major contribution to an attractive and competitive environment. This is the only way for a com­­­pany to maintain long-term success. This is the only way to meet the needs of our staff today and tomorrow, and this is the only way to remain an attractive em­­pl­o­yer. Die Autorin studierte Rechtswissen­schaf­ten an der Universität Hamburg und er­­­warb einen MBA der Otto Beisheim School of Management (WHU) und der Northwestern University sowie den Exe­cutive Master of European and Inter­na­tional Business Law der Universität St. Gallen. Seit 2009 ist Suckale bei der BASF tätig, 2011 wurde sie in den Vor­­stand der BASF SE berufen.